The optional RC-SS20 remote control for the SS-200 and SS-CDR200 solid-state recorders. 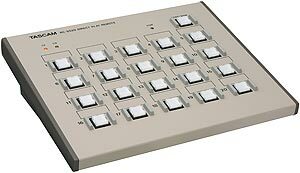 A panel of 20 illuminated buttons provides instant access to tracks on those recorders. The RC-SS20 supports the Flash Play mode so effects and announcements can be preloaded for instant playback. An “End Of Message” indicator shows when the end of the track is approaching. Tascam's newest collection of single rack space solid state recorders for the installation market. Three models: SS-R100, SS-R200 and SS-CDR200. They are all single-rackspace solid state recorders designed for applications that currently use a cassette, CD or MiniDisc (MD) recorder. They all record to SD, CF or USB memory in uncompressed WAV format, or in compressed MP3 format for extended recording times. Model SS-CDR200 will also record onto Compact Disk (CD-R & CD-RW). And it is possible to use all models to copy recordings between each of their media. The SS-R100 is equipped with unbalanced audio inputs and outputs, whilst the SS-R200 and SS-CDR200 also have balanced inputs and outputs. All models have SPDIF coaxial digital in and out with sample rate converter, a wired remote control and a computer keyboard input for folder/file naming and remote control. And professional features like pitch control, key control, auto cue, and many more are also included.